Swapping my Wednesday Inspire posts for this. Just this once guys, just this once. Seriously? Do I really have to do this? I mean, I'm very sure there is nothing new you guys want to know about me, is there? Or am I wrong? 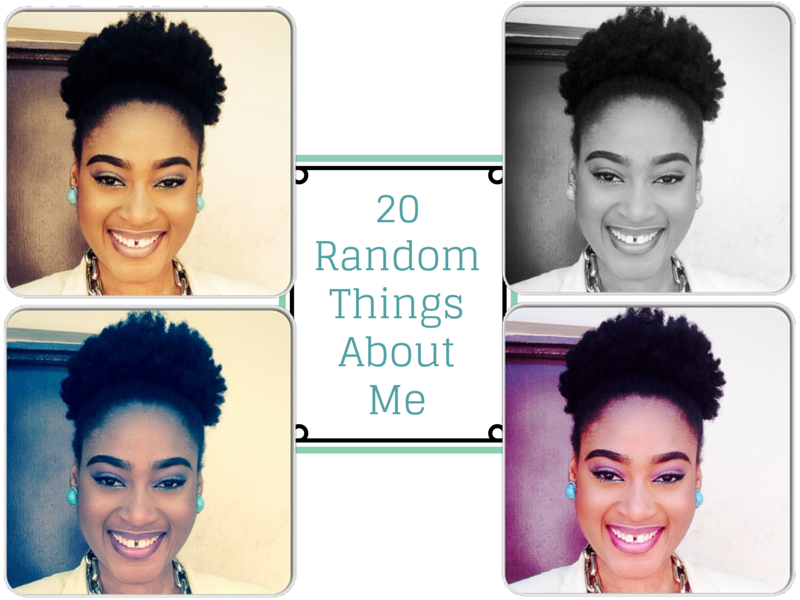 I was tagged by Love Ifeyinwa to do this post way back in August but was too shy to tackle it. Seen so many of my fellow bloggers putting theirs up and figured I'd perhaps give it a try. I like being by myself most of the time. I can stay indoors by myself, just make sure I have food, water, internet and electricity and I'm in heaven. So I'm kinda schizophrenic. Lemme explain, I loooove to meet new people and hangout with friends but that's after they've spent hours trying to drag me out of my house. What usually happens is I hear about an outing, fit it in my schedule and when that day comes around I go "oh never mind, I won't be missed" and I promptly flop back on the pillow and continue watching TV or browsing or whatever it is I was doing. I hate to cook. Part of me being lazy I guess. That's partly the reason why I don't really like food a lot. While we are talking about food, my favourite food is porridge (beans, yam, plantain. Beans is the first thing I learnt to cook). I love to dress like a man, literally. Pants, sweaters, waistcoats, tie, oxfords, brogues. Menswear inspired is totally my thing. I'm slow to making decisions. This is mainly because I rarely act out of impulse. The thought has to be thoroughly processed in my head, accepted and the reactions to that action processed before taking action. If it is an outing, I have to plan weeks ahead. I'm not one of those people who close from work and say 'I feel like a movie'. Nah, that's totally not me. I love horror. Horror books, movies etc. When I started writing, I had these unique pieces I called 'Abstracts', I poured out that part of myself into those things. I get more done when I'm under pressure or there is a deadline or something of the sort. I love black. I can wear black everyday for a year. I'm hairy. At first I wasn't so gong-ho about how everyone says my hair has grown so fast and used to wonder why but now I can attribute it to the fact that I'm hairy. Same as my brows. I am easily bored and get restless very quickly. I'm not a communal person. I love books. I used to read at least 10 novels a months even with school and work (I should get back to that haven't read a proper novel in a while). I'm scared of new born babies and don't carry babies until they are like 3 or 4 months old. I almost never get upset or angry. Absolutely NEVER throw tantrums. I can never understand jokes that are directed at me. The person usually ends up frustrated and gives up because I am genuinely clueless. The beauty of such jokes, I hear, is when the person gets it. I'm good at finding faults with myself so when someone says it, it isn't news to me but something I accepted and already working on. I am OCD about MY property. Don't touch it, take it or borrow without my knowledge. If I say no, don't get upset cos it makes my no all the more stronger. Not exactly 21 but I started growing my natural hair out of frustration and my mom did threaten to relax it in my sleep but now it is kind of like part of my identity and I can't imagine having relaxed hair again. So that's it. I kinda feel naked.